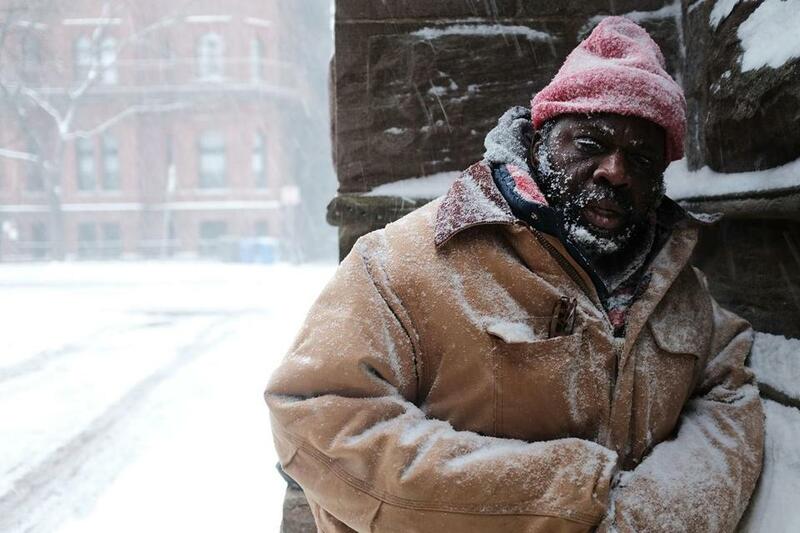 George, who is homeless, paused in a church alcove as snow fell Jan. 4. NAME ANY SOCIAL ILL, and it likely has its most devastating impact on people of color. That’s why the results of a new study on one of this nation’s most persistent problems are shocking, but not at all surprising: People of color are far more likely than white people to be homeless. The Center for Social Innovation, based in Needham, analyzed six communities, including Atlanta, Dallas, and San Francisco. It found more than 78 percent of those experiencing homelessness are people of color. Nearly 65 percent of them are black. Such results are as obvious as they are disheartening for Jeff Olivet, chief executive officer of the Needham-based Center for Social Innovation, which launched the study. In 2016, the center launched the Supporting Partnerships for Anti-Racist Communities to study racial inequities in homelessness, and its findings are staggering. Among 18- to 24-year-olds in the six communities included in the study, 89 percent of homeless people were black, Hispanic, Asian-American, or Native American black people accounted for 78 percent. Nationwide, black people alone make up more than 40 percent of those experiencing homelessness. Some families in need of emergency shelter must prove it by spending at least one night in a place not safe for human habitation. Here’s where some people may claim that race is being injected into an issue that spares no demographic group. In this study, its authors cite five areas regarding racial inequality and homelessness — economic mobility, housing, criminal justice, behavioral health, and family stabilization. One or more of those categories can play into how anyone becomes homeless. Yet a nation built and sustained by racist practices allows people of color fewer safety nets to avoid homelessness, Olivet said. When on the brink of homelessness, people naturally turn to family and friends for help. But when they, too, are living precariously — often undermined by the same systemic racism — they can’t provide much support. Long before many people of color experience homelessness, society has already sabotaged and turned its back on them. To deny that racism as a factor in the disproportionate number of black and brown people who are homeless is itself a defense of racism. It’s time to “get over this idea that focusing on our most vulnerable citizens is polarizing a conversation,” said Marc Dones, the associate director of equity initiatives at the Center for Social Innovation. For the second phase of its study, the center is adding more communities. Its goal is to create “a racial-equity approach” to the issue of homelessness. Among other things, that means diversifying boards of directors for organizations working on homelessness; better training of staff to understand and recognize the intersection of racism and homelessness; and developing specific programs and resources for people of color. Doubting the effects of racism only sustains it. By acknowledging its presence we can begin to address the deep inequities of homelessness — and a host of other issues that have plagued our nation for too long.